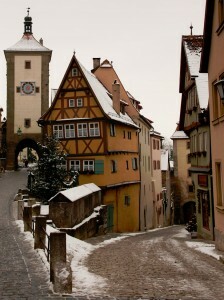 The Plonlein Fork, shown in this jigsaw puzzle, is one of the most picturesque spots in Rothenburg, which itself is one of the most picturesque towns in Germany. The name refers to a fork in the road, one way leading uphill and one way leading downhill. Rothenburg ob der Tauber, to give it its full name, is a well preserved Medieval town located in the Franconia region of Bavaria in southern Germany. The town is located on Germany’s famous ‘Romantic Road’ and is well known for its half timbered houses, covered town walls and museums devoted to such things as Christmas and punishment. If you spend the night there, do not miss the night watchman, who still makes his rounds. Credit: Special thanks to LenDog64 for making the photograph used for this jigsaw puzzle available through the Creative Commons Attribution NoDerivs license. Visit LenDog64's Flickr photostream. See all jigsaw puzzles based on LenDog64's photographs.